Heating and moving water (hydronics) is recognized as the most efficient method of creating and distributing warming energy. From the Roman Baths to Gravity Piped Hot Water Systems of a century ago natural convection of heated water provided a simple, if seemingly temperamental solution. Adding pumps (circulators) to heating water distribution has forever improved comfort an flexibility. However, their application has been less than ideal, utilizing only fixed-speed/capacity circulators, typically poorly applied to residential heating in particular. Using a “one size fits all” approach and swapping sizes to effect results has been a thorn to the trade suppliers. Applying switchable, multi-speed circulators has provided an interim solution to poor matching options. Further, measuring actual circulator zone supply and return temperature differentials with an infrared thermometer while selecting speed(s) has provided a more efficient solution. It’s still a less-than-ideal result, with a cost premium. The Delta-T (Differential Temperature Sensing) Variable Speed Circulator has been around for some years now, providing the idealized solution to heating distribution flow management. It has arguably fallen far short of its potential, burdened by high initial cost, audible operational “whine” and low speed “growling”. Occasional high load torque stalls further contributed to its unknown nature. Enter the ECM (Electronically Commutated Motor), the latest iteration of the “intelligent” Delta-T Variable Speed Circulator. The “heir apparent” is whisper quiet yet powerful, dramatically reduces power consumption with no “torque stalls”, displays great functional data and at a palatable cost. Taco® Comfort Solutions of Cranston, RI also claims up to 15% fuel savings along with an 85% energy drop with their 00e Series VT2218 ECM Circulator, pictured. Author’s Note: We former High-Tech Process Engineers were applying “Stepper Motors”, the ECM predecessors to Machine & Process Control over 40 years ago. Finally, the Heating World is getting some real tools to work with! The Delta-T Circulator is and has always been marketed as an enhanced replacement for a fixed or multi-speed circulator. Have a zone performance issue? Substitute a Delta-T and “tweak” it in. Problem fixed, within the constraints of the zone design and a 3X cost premium of course. This latest (and supplier exclusive) Taco® VT2218 is being very well received, breaking the “Cost-Performance Stigma” of its predecessors and counterparts. We love it! Providing uniform heating performance under normal multi-zone demands. Simultaneously servicing an Indirect Water Heater (IWH) to optimize both domestic hot water (DWH) and heating water generation. Prioritizing DHW generation within varying area heating demands. Accommodating differential temperature branching such as radiant zone(s). Satisfying both current and future (planned expansion) demands without an efficiency penalty. Providing beneficial System Service & Reliability projections. Over the past fifty (50) years we have installed and monitored “conventional” hydronic (FHW) heating systems, focusing on component selections, their performance and service levels. This continual qualification process has yielded a set of Premium American Components with “zero-fail” histories, at the expense of other NAFTA, Euro & Chinese products. Recognizing the potential of Delta-T Hydronics Distribution as previously noted, about five (5) years ago began a concerted effort to select and qualify the dedicated system circulator application. Our independent work using three (3) successive iterations of Taco® VDT, HEC and VT/00e Products has yielded not only a viable, but a superlative Packaged Delta-T ECM Hydronic Heating Appliance™. 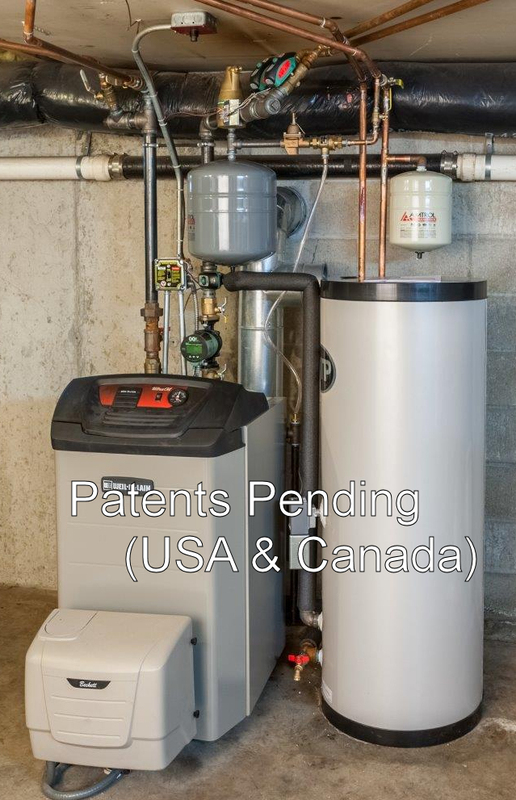 Its performance is principally based on our Proprietary Near-Boiler Piping System that constitutes the basis of our Non-Provisional Intellectual Property Protection Submission (Patents Pending – USA & Canada). So what began as an “evolutionary” effort to apply a newly available “tool” in the resultant has approached a “revolutionary” one. Our Packaged Delta-T ECM Hydronic Heating System™ is actually a FHW Heating Appliance, an industry first! Placing the Delta-T ECM Circulator into a full hydronic (FHW) heating system we slogan as“Putting an ‘Automatic Transmission’ on a Boiler”. Coupling “intelligent” Taco Zone Sentry®valving (pictured), a “high-mass” boiler (Weil-McLain UO – pictured)and an integrated IWH (HTP SSU45– pictured)dramatically reduce complexity and idealize hydronic system performance. In our introduction we referenced the “natural convection” (gravity heating) used by the Romans, et al that prefaced our “modern” hydronics. Our optimized Delta-T ECM System exhibits exceptional gravity convection qualities, continuing heating upon circulator disablement or with zone valve manual operation. Short of a full electrical outage significant gravity convection heating continues, providing a useful fail-safe protection feature. Now let us really “Raise The Bar”. Here is performance data taken from two (2) similar “beta test sites” in our grouping. This is the new “Bar Height”. We challenge ANY Tradesman or System Installer to raise it. Delta-T ECM Hydronic Distribution is singly the most significant and cost-effective contemporary heating advancement. This technology is applicable to any fueled hydronic heating system with substantial packaging and cost benefits. System configuration using a Dedicated Delta-T ECM Circulator further reduces physical and technical complexity while idealizing hydronic performance. Our Packaged Delta-T ECM Hydronic Heating System™ is the first, true Hydronic Heating Appliance, considering its intrinsic architecture, performance and as-installed economics. This is the new Standard of Measure in Hydronic Heating.